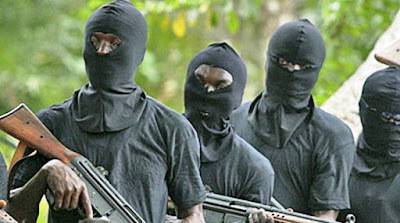 Gunmen, yesterday, shot dead a passenger and abducted four others travelling in a commercial vehicle along the notorious Owo-lkare road in Ondo state. Vanguard was informed that one of the passengers, who put up a fight, was shot dead on the spot. However, hours after the abduction, families of the victims have been contacted to pay ransom of N15m on each of the victim. A family source said, in Akure last night that they have been able to negotiate the ransom down to N1m each for each of the victim. It was gathered that the four victims and their driver who were heading to Akure from Ikare Akoko were stopped around Oba Akoko road and were forcibly abducted and marched into the bush. Speaking on the incessant activities of kidnappers in the area, the Oloba of Oba-Akoko, Oba Nurudeen Adegoroye called for more security presence in the area. Oba Adegoroye said a military checkpoint between the dangerous spot between Owo and Oba-Akoko will curb the activities of the kidnappers. The family source said that the abductors have agreed that N1m be paid before the victims are released. Spokesperson of the Ondo Police Command, Femi Joseph said investigations into the incident was underway adding that the miscreants would be smoked out from their hiding.